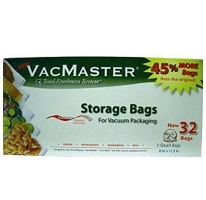 VacMaster quart storage bags are used for vacuum packaging. There are now 32 bags included in the package, with patented, Vac-Strip technology to keep food fresh up to 5 times longer. Typical embossed-channel vacuum bags tend to flatten over time, minimizing the channel for air to escape, which leads to an incomplete vacuum process. This unique bag design maximizes bag suction during the vacuum process, decreasing machine stress. These bags work harder so your machine doesn’t have to! Each of the bags has a third layer of perforated material, creating a channel for air to escape. The innovative design gives an optimal vacuum process every time.